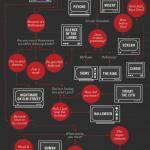 Here is a fun infographic that asks a series of questions leading to a fun way of picking the perfect horror movie for you to watch. With so many possibilities to fit every mood and every type of person, it is a great start for pleasing the non-horror fan with you. Tell us what you think, did this infographic help you out?